Incarceration affects some people and communities more than others, and these patterns are often more pronounced among those who spend the most time in prison. Here, we take a closer look at patterns of long-term incarceration by race, age, gender, and other characteristics. “It wasn’t easy. I spent all my youth—my teen years, my youth. I went away at 15. I didn’t get out ’till I was almost—I was 42. “Everything that you would normally do in your twenties, I have to do in my fifties. I wanna start a little business. I wanna buy a home. “I was in prison for 28 years. A lot of my people…that were there when I came in the door are dead. They were older women. …If they don’t die from some type of cancer or something, serious disease, they’re becoming mentally ill and…their minds are gone. Racial disparities in prisons are starkest among those serving the longest terms. 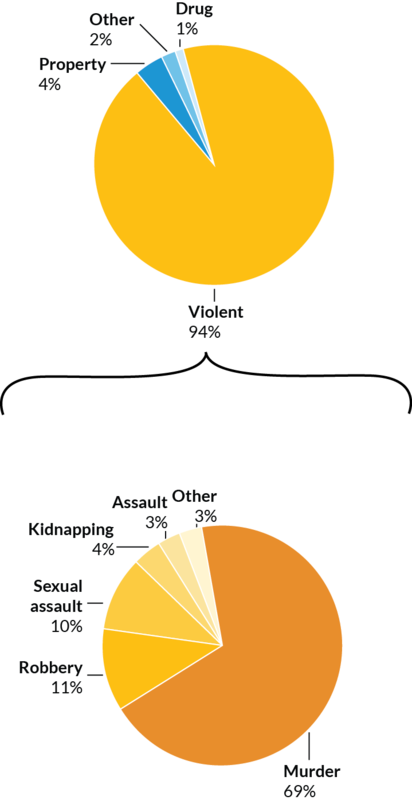 Black people are incarcerated at a rate over five times that of white people nationwide (and significantly higher in many states). Other racial and ethnic groups face disparities in imprisonment, but major data gaps make it difficult to measure the extent of these disparities. These same gaps prevented us from looking at the full picture of racial and ethnic inequalities in long prison terms. The black incarceration rate has decreased over the past decade, likely as a result of reforms for less serious drug offenses. But people serving the longest terms remain untouched by such policy changes. In 35 of the 44 states with complete data, racial disparities among people serving the longest 10 percent of prison terms are larger than disparities in the overall prison population. 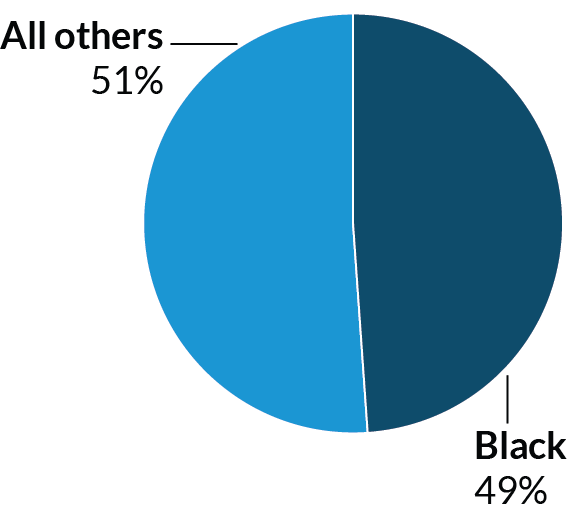 In Pennsylvania, for example, black people make up 49 percent of the state prison population but 60 percent of those serving the longest prison terms. Though most states have seen a decline in racial disparities among people serving shorter prison terms, the story is less consistent among those in prison the longest. In recent years, racial disparities have decreased in at least 42 states for people serving less than 10 years. But in at least 18 states, disparities actually grew among people serving 10 or more years. Current reforms fail to address these glaring disparities because they largely leave out those serving the longest terms. Nearly 40 percent of people serving the longest prison terms were incarcerated before age 25. Looking at the top 10 percent of people serving the longest prison terms in each state, we found that many people were sentenced for crimes committed in their youth. Some have been incarcerated for more than half their lives. In California, this is true for more than 5,500 people; in Florida, nearly 3,000. Recent Supreme Court rulings have upheld that youth under age 18 are fundamentally different from adults—that because their brains have not fully developed, they are less capable of self-control and responsible decisionmaking—and cannot be sentenced to death or mandatory life without parole. These rulings offer hope to thousands of people serving life sentences for crimes they committed before age 18. Though youth ages 18 to 24 are considered adults in the eyes of the law, a growing body of scientific research suggests that a person’s brain is still developing well into his or her twenties. This means that 18- to 24-year-olds are particularly amenable to change and likely to age out of criminal behavior but do not receive the same protections as youth under 18. These young people are still given extremely long sentences, including life without parole. And even those given a chance at parole are often blocked by parole boards that, decades later, continue to judge them solely by their original offense. Young adults, like adolescents, are more amenable to change. …Often, people who engage in risky behavior or in crime as adolescents or young adults…naturally age out of that. It’s a period in which people are undergoing legal socialization, making that transition from teen or adolescent into fully independent adulthood. So I think it’s an important time period for addressing and rethinking our response to young adults both for their benefit [and] society at large. Note: Values do not sum to 100 percent because of rounding. Race and age disparities combine, with devastating results. 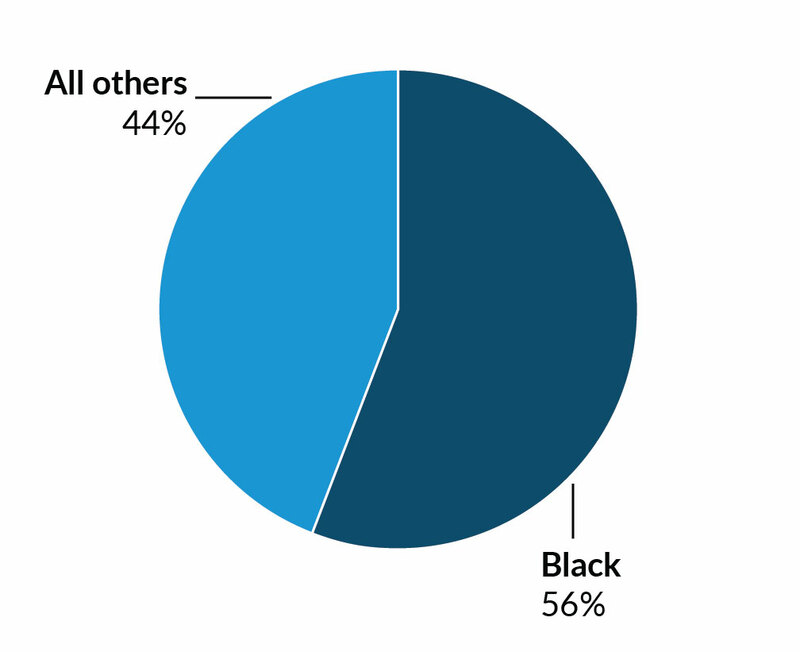 One in five people in prison for at least 10 years is a black man incarcerated before age 25. 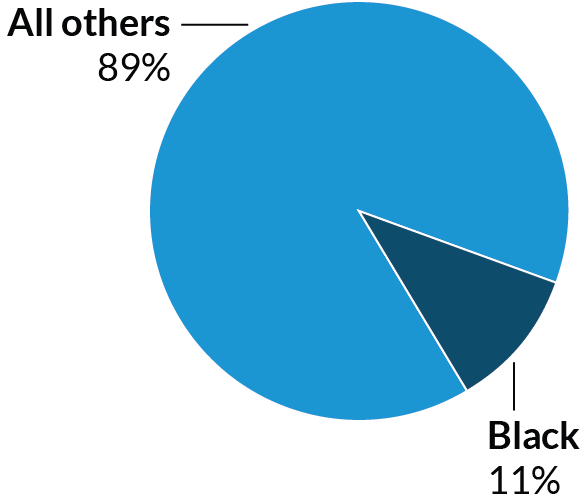 Comparatively, just over one in eight in the general prison population is a black man incarcerated as a youth. This staggering disparity reflects and perpetuates social inequalities, keeping a disproportionate number of young black men in prison and out of their communities for long periods. 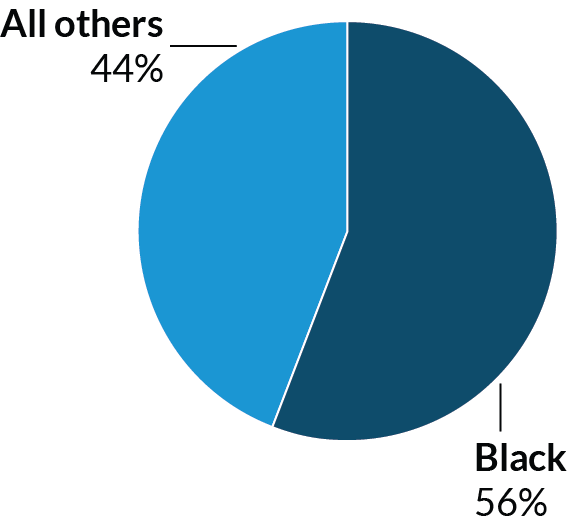 One in five people in prison for at least 10 years is a black man incarcerated before age 25. A growing share of women in prison are serving long prison terms. Women in prison are a rapidly growing group—and in most states, a growing share have served more than 10 years. 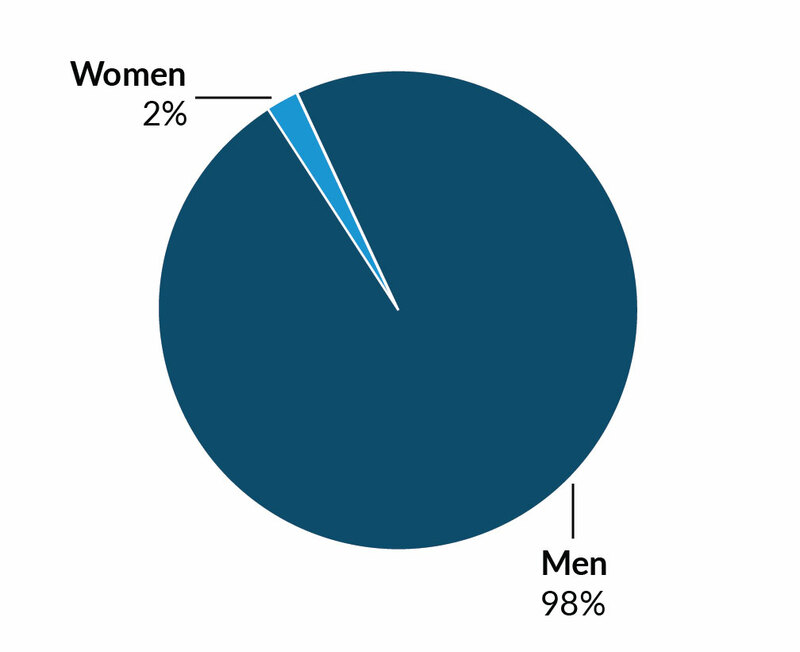 In Michigan, 8 percent of women in prison had served at least a decade as of 2000; by 2013, that number was 13 percent. In Wisconsin, this figure rose from 1.8 to 6.5 percent over the same period. Across the 44 states we looked at, over 5,500 women had been in prison for at least 10 years. Overall, women are more likely to be sent to prison for a property or drug conviction than a violent conviction. 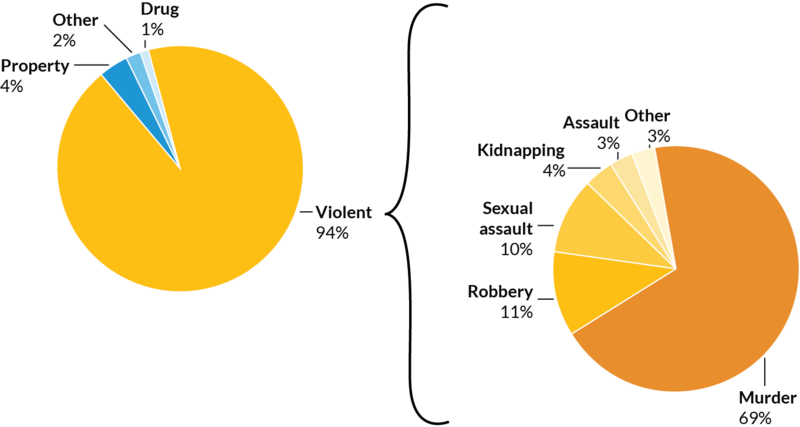 In the most recent year of data available, only 37 percent of women in prison had a violent conviction, compared with 55 percent of men. But among people serving the longest terms, a full 92 percent of women had been convicted of a violent offense, roughly on par with men (91 percent). Because they are a relatively small group, little is known about women serving long prison terms. But ample research shows that women’s experiences before, during, and after prison often differ greatly from those of men. Incarcerated women are much more likely to have experienced abuse before entering prison, and those serving life sentences have reported some of the highest rates of prior abuse. Some women serving long sentences for drug offenses may have been charged as accomplices in drug conspiracies because of their relationships with men engaged in criminal activity. In some sentencing schemes, especially at the federal level, women may be held equally accountable for crimes committed by their partners despite having little or no intentional involvement. Women are also more susceptible to the challenges that come with being an incarcerated parent. 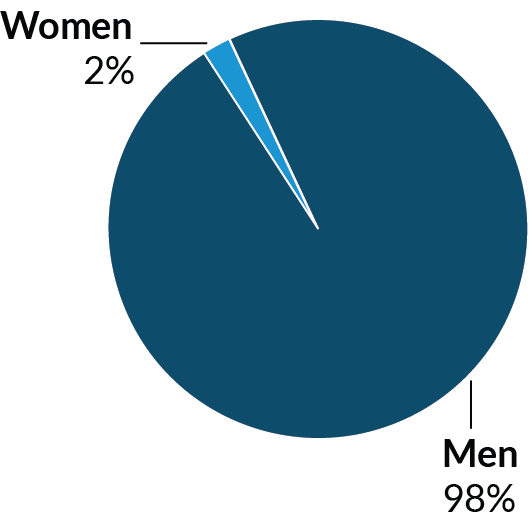 As of 2010, 62 percent of women in state prison had children, compared with 51 percent of men. As the number of women serving long prison terms continues to grow, more research is needed to understand how they are uniquely affected by incarceration. People incarcerated the longest tend to be older than the average person in state prison. More than 30 percent of people who have spent the most time in prison are at least 55 years old, compared with just over 10 percent of the overall prison population. More people serving longer prison terms means that more people are growing old in prison. Between 1993 and 2013, the share of people 55 or older in state prisons increased by 400 percent. This was caused in part by an influx of older people, but it also reflects a greater proportion of people serving longer prison terms. Prisons are typically ill-equipped to address the needs of the elderly and disabled, and prison staff may not be prepared to treat age-related conditions. Many of the stresses of prison, such as victimization, discipline, and poor conditions, are even harder on older people. Health care in prison is also extremely expensive, and people require more support as they grow older. The annual cost of incarcerating someone over age 50 is twice the cost for the average person. 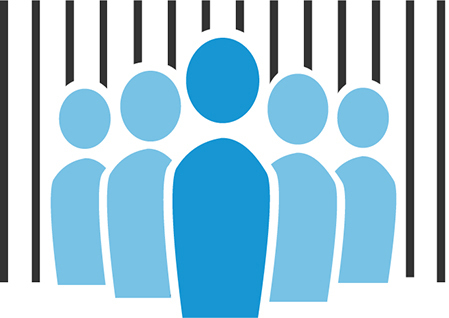 Reform efforts must consider those who are most affected by long prison terms. Shortening long prison terms won’t be enough to fix the criminal justice system. Reforms must increase racial and ethnic equity, not aggravate disparities. Women and their experiences must be included in policy conversations. Policymakers will need to reconsider whether it is sensible or fair to condemn people in their teens or early twenties to long sentences or to hold people in prison well into old age. To fully address these issues, we must take a hard look at the systemic inequalities driving these patterns. People who have served long prison sentences share their stories of the effects of long-term incarceration. Copyright © July 2017. Urban Institute. View this project on Github.